There are things about this issue that I liked and that I didn’t like. Harley’s dynamic with Poison Ivy was pretty ace all the way through, for instance. I loved the way that the two of them interact and the way that their friendship is built up, with hints perhaps that there’s more to this relationship than what we see. So there’s a nice bit of a mystery there. 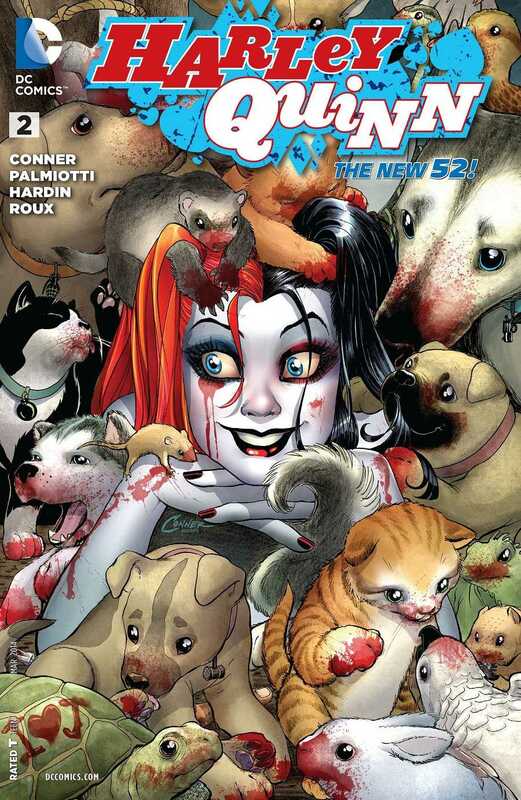 We also have some great humour from Harley at times, and that serves to brighten up the story quite a bit. But then there are things like how she practically feeds a man to her dogs, whom she has recently freed from a pet shelter, along with some other animals. It is somewhat grotesque and for me doesn’t quite fit the direction that I see the story going in. At the same time, we also see how Harley is attempting to become her own person. She recently came to inherit a building and its various businesses, thanks to some mysterious benefactor who left it to her in his/her will, and she’s moved to Brooklyn and into the building to manage it as the new landlord. We see some good, decent scenes at the start in which she carries out those duties and there’s some really good dialogue involved as Harley “negotiates” the rent with a tenant, who owns the business known as the House of Wax and Murder, a museum devoted to the most grotesque and violent murderers of recent history, including, the Joker. The thing though is that we don’t really see any development of her supporting cast, the ones that were introduced in #1 last month, and who I had been looking forward to seeing here. So there’s that bit of disappointment with this issue. And Harley’s talking beaver, who is supposedly an undead or something, I don’t know, doesn’t really add anything to the story at all. He is just… there, a prop that speaks up every now and then but is otherwise quite useless. I’m not really sure what the intent behind including him in this series is. Where the art is concerned, the issue has Stephane Roux assisting Chad Hardin on the pencils, and I take that as quite a significant development, given how early into the series we are. Is Chad Hardin not able to meet the deadlines? Was Amanda Conner, one of the writers on this issue and one of the industry’s best artists as far as I’m concerned, not able to chip in? There are moments when the shift in the artwork is obvious, and I’m not really a fan of that. Plus, there are several instants where the many characters’ facial expressions are just odd, or their body language is totally odd. The art is detailed and Harley often gets the best panels, but taken together, I’m definitley not so much a fan of the issue this time around. This could have been a really good issue, but it unfortunately falls far short of the mark and that is somewhat depressing, given the high hopes that I had for it. More Harley Quinn: #0, #1. Posted on January 26, 2014, in Comics Reviews, Review Central and tagged Alex Sinclair, Amanda Conner, Batman, Chad Hardin, Comics, Comics Review, DC Comics, Funny, Harleen Quinzel, Harley Quinn, Humour, Jimmy Palmiotti, Joker, New 52, Review, Review Central, Stephane Roux. Bookmark the permalink. 8 Comments.